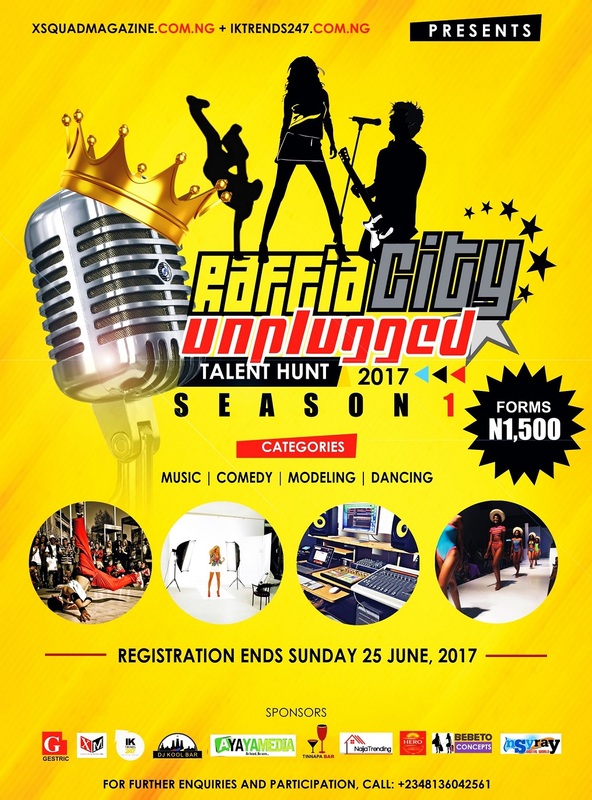 N30,000 TO BE WON AT “RAFFIA CITY UNPLUGGED TALENT HUNT” SEASON 1 | REGISTER NOW. South-South #No. 1 entertainment blog xsquadmagazine.com.ng and Akwa Ibom leading news blog iktrends247.com.ng teams up to present “RAFFIA CITY UNPLUGGED TALENT HUNT” SEASON 1. “RAFFIA CITY UNPLUGGED TALENT HUNT” SEASON 1 is a talent hunt that will accommodate all the entertainers as far as showbiz is concern. The Talent Hunt is sorely aimed at discovering new breed in Singing, Dancing, Comedy and Modeling as well as creating a platform where all these entertainers will showcase their God-given talents while making money with it. The competition is open to all who are talented in respect to singing, song writing, dancing, comedy and runway modeling. “RAFFIA CITY UNPLUGGED TALENT HUNT” SEASON 1 will not just give all the youths the platform to showcase their talents in the respective categories, but to serve as an eye-opener to be real as they embark on the road to Stardom. To realize their long-held dreams of Singing, Dancing, Comedy and Runway Modeling as well as making a career out of it. To educate and enlighten young Nigerians through good music, good dance steps, Comey and mind blowing runway modeling style. Star Prizes for each category is N30, 000. A Signing Recording Deal for Music, Free Photo/Video Shoot, Massive Media Hype and Exclusive interviews + Music Collaboration for the Winner in the Music Category. A Signing Deal into a Modeling Academy, Massive Media Hype and Exclusive interviews + Free Photo Shoot for the Winner in the Modeling Category. A Signing Deal into a Comedy Academy + Featuring in Comedy Skits and Videos for the Winner in the Comedy. A Signing Deal into a Dance Academy + Featuring in New Music Videos for the winner in the Dancer Comedy. 23 Okop Eto Road, Ikot Ekpene, AKS. Call Lion Edidiong on 08166703405. Deadline for picking of Forms is Sunday 25th June, 2017 while Auditions holds on 30th June and 1st July 2017 at Tinnapa Bar by 12Noon. The Grand Finale is scheduled to hold on Sunday 16th July, 2017.